Virtual Girls Night Out - Make It Work! Well, we have a new (to us) car. It's a Honda Odyssey. I like it, but my girls want our old van back. I'm not exactly sure why, other than the fact that change of any kind is difficult and they probably want to stick with what they know, even if that means, no air conditioning, constant repair bills and getting to know the tow truck drivers by name. Change is all around! Let's hold on tight, hope for the best and get going with our blog party, the Virtual Girls Night Out! Do yourself a favor and get this song, listen to it while in the garden, going for a walk, or driving. Love it! 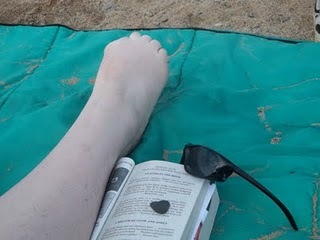 Our dear blog friend Mary at Kyooty Center took our little gem to the beach. What a lucky, little rock :-> Visit Mary at Kyooty Center and find out more about the T.H.S.R.P. stay in Canada. So fun! Next stop Tracie's place in Florida. Would you like to have the Traveling Heart-Shaped Rock Project visit your blog? We have 22 stops so far and you would be a welcome addition. Click here for all the information. Alright blog pals, have fun at the Virtual Girls Night Out!